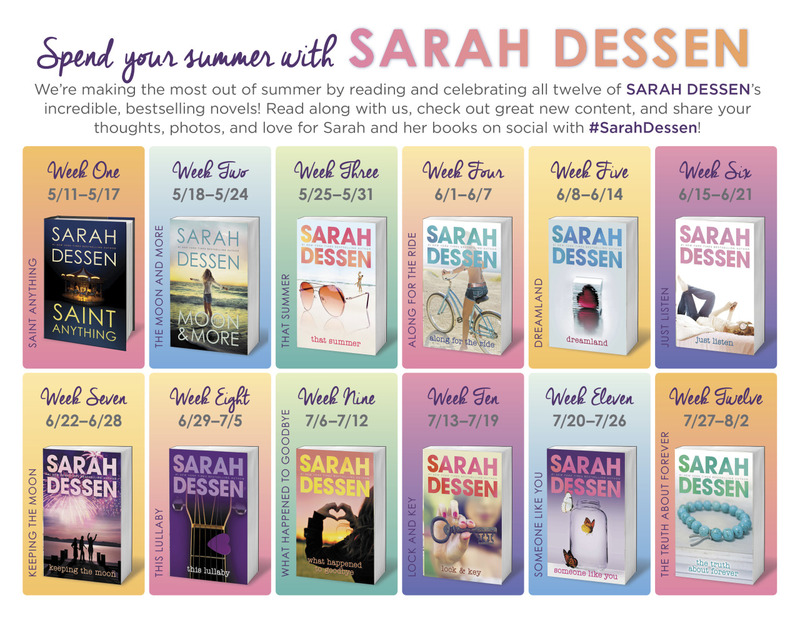 I am thrilled to be apart of the Summer of Sarah Dessen blog tour, hosted by Penguin Teen! As an absolute fangirl of everything Dessen writes, it's an honor to be promoting her latest work SAINT ANYTHING as we celebrate her beautiful craft all summer long. Week Six highlights JUST LISTEN by Sarah Dessen, a powerful novel that illustrates the beauty in shutting out the negative and listening to the silence all around you. My detailed thoughts on this lovely story are below, followed by original content from Penguin Teen and more details about Summer of Sarah Dessen. About the book: Last year, Annabel was "the girl who has everything"—at least that's the part she played in the television commercial for Kopf's Department Store. My thoughts: I enjoy Sarah Dessen's books because even though they may look light & fluffy on the cover, the story within is always deeper and meaningful. She has a gift of writing stories about characters with problems that are identifiable, something that we can all relate to. I think she is one of the best YA authors out there at the moment who can send young teenage girls profound messages in such an easy, calming manner - instead of shoving morals down your throat. Just Listen is about a girl named Annabel who is the youngest of 3 girls in her family. From the outside, her home looks picture perfect - literally. She is someone who is considered popular at school & appear to have the "perfect" life. Over time these picture perfect qualities begin to break & shatter in to a million little pieces. Annabel's family is now dealing with her sister's anorexia problem. At school Anabel is shut out from the popular crowd, mainly by the ring leader Sophie (her ex-best friend), because of an incident that was misunderstood placing Anabel at the wrong place, at the wrong time. Just when Anabel's world is closing in on her, she meets Owen - the bad-boy-turned-good-again who reaches out a hand and asks her if she needs help. It's through his love of music that he slowly rebuilds Anabel's faith in herself, her friends at school, and even her family. The power of shutting out the negative and "just listening" to the silence around you. The beauty of Sarah Dessen's writing really shown through in the family's struggles with anorexia. She did not create the story around that, but merely introduced it in appropriate places. The evil that surrounds an eating disorder was present and I felt that Dessen did a good job of showing the ugly side, but also representing the positives on how one can seek help for it. The characters in this story felt very real to me. I could see the wrong choices that Anabel had made and wanted so badly to shout them out to her, but just like every other teenager - I knew she had to figure it out for herself. The relationship between Annabel and Owen was very sweet. I give praise to Dessen for not throwing an instant romance in to the mix, but more so a slow build to a lasting friendship. If you have not read anything by Sarah Dessen, I suggest starting with this book. It's just the right amount of heart-felt laughter mixed in with genuine honesty. 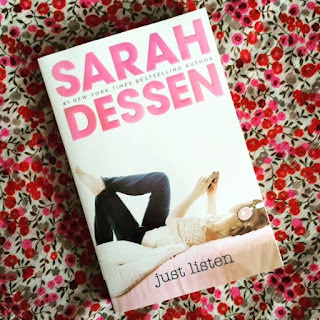 I also enjoyed this book due to it's musicality references :-) And as Sarah Dessen writes... "Don't think or judge, just listen." I just LOVE Sarah Dessen! 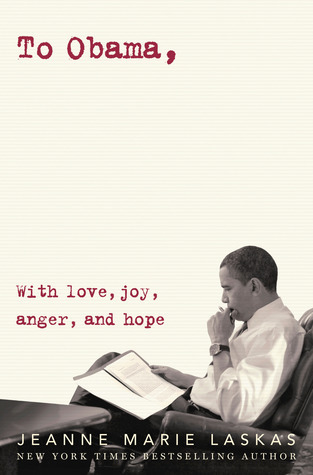 I've read everything she's published to date, and each one has been a different, but overall, lovely reading experience. She really knows how to create characters that are relatable and complex; she tells stories that feel authentic and deeply emotional. I'm so glad you felt this way about Just Listen!